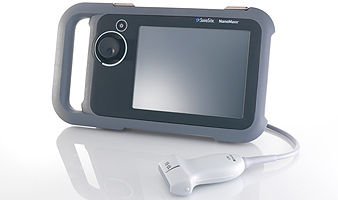 Supremely portable and incredibly tough, the NanoMaxx™ ultrasound system combines 'Best in Class' performance with affordability and simplicity. Offering a fluid-resistant touch screen interface that is easy to clean and disinfect, combined with unprecedented ease of use, the NanoMaxx system sets a new standard in patient safety. When patient safety, bedside diagnosis or accurate needle guidance is a priority, the NanoMaxx system is the ideal tool to deliver results. The M-Turbo® system is ideal for broader applications, this versatile powerhouse with brilliant image quality can help you perform anything from abdominal to vascular, to cardiac exams with speed and accuracy. We engineered the M-Turbo ultrasound tool to give you radically better image quality with sharp contrast resolution and clear tissue delineation. You can better visualize detail, improving your ability to differentiate structures, vessels and pathology. Because the more you can see, the more you can do for your patients. The MicroMaxx® ultrasound system is designed to make your job easier, faster, and more accurate, the MicroMaxx system makes point-of-care ultrasound an affordable reality. It offers impressive image quality. Wireless data transfer. Designed for durability. Medicare System knows that personnel, equipment, and medical supplies frequently leave little space for diagnostic ultrasound technology at the point of care. Medicare System’s mountable ultrasound systems offer hospitals a zero footprint ultrasound imaging solution. The systems can be mounted to a cart, wall, or ceiling, and have an intuitive design and simplified controls that enable clinicians to focus in on their target areas in a matter of seconds. High-resolution images help clinicians see exactly where to perform procedures and allow for accurate diagnoses when treating patients. Advanced needle visualization makes the needle clearly distinguishable at steep angles while maintaining striking image quality of the target and surrounding anatomy. Advanced needle visualization requires no setup time, requires no additional hardware or expensive needles and is accessible with straightforward on/off functionality.